A Nicolai Bryhnisveen penalty shot and a man-of-the-match performance by netminder Matt Hackett secured a 4-3 victory over the Manchester Storm and two crucial points for the Genting Casino Coventry Blaze at the Skydome Arena. With the scores tied at 3-3 at the end of 60 minutes, and neither team able to find the net in overtime, the game went to penalty shots. After Ben Lake, whose 14-game point scoring streak came to an end, and Luke Ferrara had scored for the Blaze and captain Dane Byers and Luke Moffatt had scored for the Storm, it was left to Norwegian defenceman Bryhnisveen to seal the victory with the winning goal. 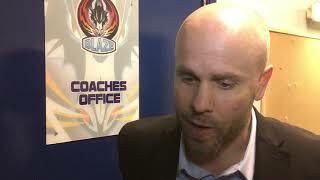 The Blaze started the game missing forwards Thom Flodqvist and Jake Hansen (injured) as well as Canadian defenceman Justin Hache, who was serving the first game of a two-game suspension following an incident in Saturday night’s game against the Belfast Giants. The Storm were missing Shane Bakker. Coventry started the game brightly and took the lead on a powerplay goal from Bryhnisveen, who hammered home his ninth league goal of the season with a slapshot from the blue line at 8.19. Just over four minutes later the Blaze doubled their lead when captain Kevin Morris finished off a lovely passing move involving Alex Nikiforuk and Tim Crowder to score his seventh goal of the league campaign at 12.26. The Blaze ended the first period ahead 2-0 but the Storm started the second period in determined mood and their pressure was eventually rewarded when Byers scored on the powerplay, following some great stick work by GB international forward Mike Hammond, at 30.07. 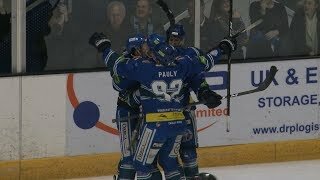 Coventry were presented with a great chance to restore their two-goal lead when they found themselves on a 5-on-3 powerplay. But despite having the two-man advantage for nearly 90 seconds they failed to take advantage, with Harrison Ruopp denying Crowder with a great defensive play, and the period finished with the Blaze leading 2-1. Less than five minutes into the third period the Storm equalised through Hammond (44.59). The Blaze thought they had retaken the lead when the puck squeezed into the Storm net at 49.40, but the goal was washed off by the referees after a long review. However, less than two minutes later the Blaze did retake the lead when a shot from Ferrara on the powerplay rebounded onto the skate of a Storm player and into the net to give the GB international forward his 12th league goal of the season at 51.23. But the Blaze lead was short-lived as the Storm equalised at 55.20 when a speculative shot by Rob Linsmayer came off a Blaze player and into the net. With Hackett and Storm netminder Matt Ginn both putting in man-of-the-match performances neither side could find a winning goal in open play, and it was left to Bryhnisveen to settle matters in the penalty shoot-out and secure a vital two points in the battle for a play-off place.